Palmiers, I love palmiers. They seem like they're hard to put together, but honestly, these were ready in a matter of minutes. The only slightly tricky part is to fold the puff pastry tightly, but really.. you could almost do it with your eyes closed. This is the second to last apple recipe for this fall.. my bag of apples seems a little morose now... there are only 3 or 4 left and I can't wait to go and pick more. Mix the sugar, salt and cinnamon. Spread 1/2 cup of sugar mixture onto your working area. Place one sheet of puff pastry on top of the sugar. Add another 1/4 cup of the mixture on top and gently press down with the palm of your hand. Using a small brush, brush off excess sugar. Peel and grate the apple. Tightly press onto a kitchen towel to remove excess moisture. Sprinkle half of the grated apple onto the puff pastry. Lightly press them down with the palm of your hand. Fold 2 sides of the square puff pastry into the middle of the puff pastry surface. Fold the sides towards the middle again to create double-layered folds. Then, fold one of the sides onto the other (as if you were closing a book). Reserve and do the same with the second puff pastry sheet. Slice the puff pastry into 3/8 inch slices and place cut side up on a parchment-line baking sheet. Bake for 6 minutes, turn the palmiers over, and cook for another 3-4 minutes or until perfectly golden. Let cool on a cooling rack. Enjoy! These look tasty as heck... but theres no recipe? Michelle: I had a problem when I first published it, but the recipe is up now! I love a good palmier and this IS a good palmier. I love a addition of apple. Beautiful shot too!!! 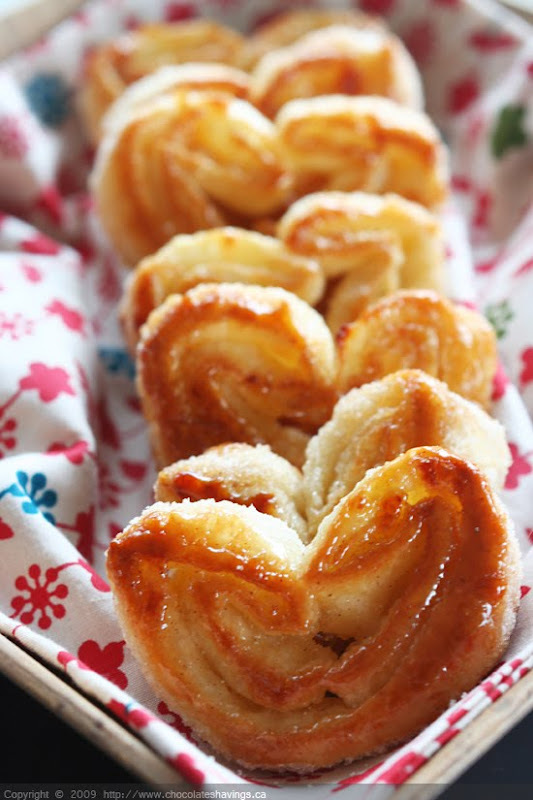 I love palmiers and have never had one with apple and cinnamon... this sounds delicious! I love palmiers too. Did you know that in Germany they're called "swine ears"? Not nearly as romantic, but just as good. These little heart shaped crunchies are perfect for a mid-afternoon snack. This looks delicious. Back to my love for apples and cinnamon. I think I have some puff pastry and I have extra apples from a tart and a cake I made. Maybe, just maybe, I can fit this in. I'm with you..I love palmiers. Crunchy, gooey and satisfying. Have never done apple- but I sure am going to make these! Sounds easy and looks delicious. What more could I ask for? This looks amazing! Great idea with the apples. I have yet to make palmiers as I always eat those giant ones at whole foods. but after seeing your perfect ones I want to give it a go. Yum! I just baked some palmiers this afternoon - I made them with mulling spices so they'd go with the apple cider I got this weekend! Putting apple IN the palmiers, though...probably even better. Ugg! I wan't one right now! If you have any trouble getting rid of these (or any other dessert) let me know... they call me "the cleaner". Ps. I can't belive you still have apples left after all these beautiful recipes! I've never made palmiers, but I think it's about time I change that! this is so beautiful. i love the lighting in this picture. I've never made palmiers but they look gorgeous. Beautiful photo! Your site is WONDERFUL!! And delicious!! And WONDERFUL!! You are so talented! Those are so absolutely beautiful and so delish looking! btw, the photo is amazing! Yum! Perfect for an afternoon treat. those puppies are jumping off the screen begging me to eat them. yum!!! Absolutely gorgeous. I've never seen 'flavoured' palmiers before, but these make me want to pull the leftover puff out of the oven and get to work. Not only is that a beautiful shot they look like they taste yummy! These look so yummy and perfect with a nice, hot cup of coffee!! Oooh, delightful! Thanks for sharing! Wow, that seems easy for such a beautiful end product. wow, adding apples and cinnamon to palmiers is genius! can't wait to try this. This is like my dream dessert! And your photos are very lovely, as usual. I've never made palmiers, even though I completely love them. I love the idea of adding apples and cinnamon even more! I can't wait to try these. You have so many apple recipes, they look so yummy! I'm definitely interested in making these palmiers. I have some home-made puff pastry in the freezer from Daring Bakers challenge...perhaps that's what I should do with them. Yum! I have some puff pastry in the freezer right now, and I believe this will be its destiny. Thanks! Hi, I like your blog and your recipes. I tried to make this palmiers last weekend and they were lovely. They were eaten up in two days, which is record in sweet meals in our home :-)) I lived for some time in spain and I loved palmiers. Thank you! ArtsyTeree:I'm glad you and your family enjoyed them. They're the perfect quick treat aern't they? I am nuts about palmiers but only like them with a really good puff pastry! these with a grated apple are new to me but sounds scrumptious!